I almost anything romance but will try most genres at least once. I'm quite interested in the Amish way of life and have read some Amish fiction so was glad to find a book with recipes i've been reading about. 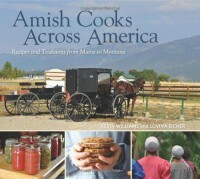 This was such a lovely look into the Amish as well as some great recipes. I was expecting it to be just a few recipes but it also contained some history of the Amish in general as well as the types of cuisine and how they vary from state to state. There were some beautiful pictures included as well as some stories from the local Amish in each state. I will definitely be trying out some of these recipes and it will be a book I pick up again.